Boil all together and keep warm. Set aside. Saute the garlic in olive oil. Add the pearl barley once the garlic is tender. 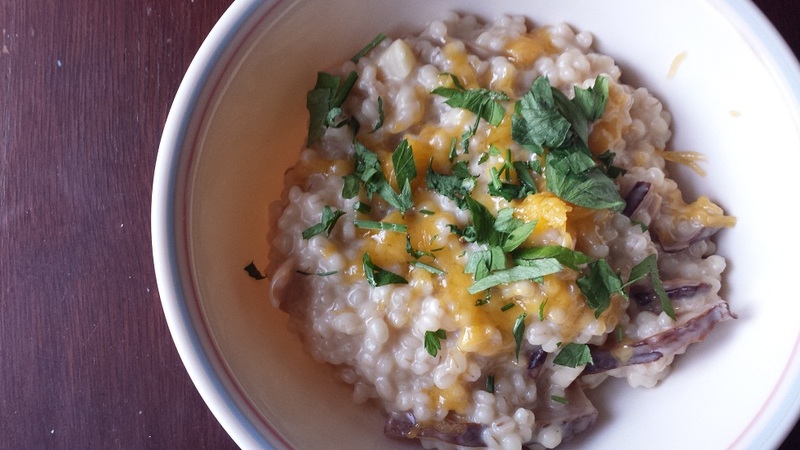 Treat like regular risotto and add a bit of stock and mix until almost dried up. Add some stock again and repeat until the grains have fully swelled (raw barley is not yummy). Add in the mushrooms from the stock. Add the cream cheese and half of the cheese. Taste and adjust salt if needed. Serve with more cheese and parsley atop.